Manufacturer of a wide range of products which include liquid nitrogen generating plant machines. Our company is engaged in manufacturing, fabricating and exporting Liquid nitrogen generating plant machine. We have sold over 450 cryogenic nitrogen generating plant machinery to our customers from all over the globe including Saudi Arabia, Kuwait, UAE, Iran, Iraq, Qatar, Bahrain, Oman and many more since 1985. Advanced cryogenic technology is used in the making of our liquid plant machinery. Customers are satisfied with the functioning and performance our oxygen and nitrogen machines. We are motivated by our quest to satisfy the requirements of our customers and offer them full value of their money. Our liquid nitrogen generating plant machine is fabricated in compliance with the international standards and protocols. We have been given ISO 9008: 2015 and CE certification for strictly following quality control measures. A CE mark on machinery is guarantee of its high quality. 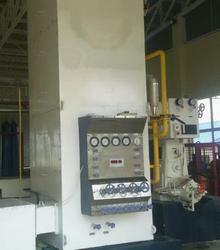 Looking for Liquid Nitrogen Generating Plant ?